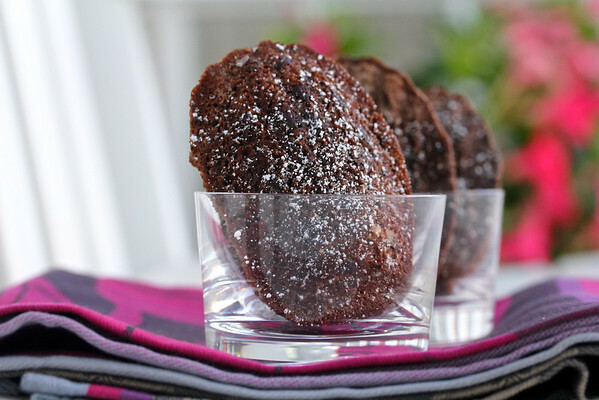 Madeleines with cocoa, chocolate chips, Nutella, and Frangelico. Little chocolaty cakes with the wonderful flavor of hazelnuts. I had to bake these. What are madeleines you ask (of course you did)? 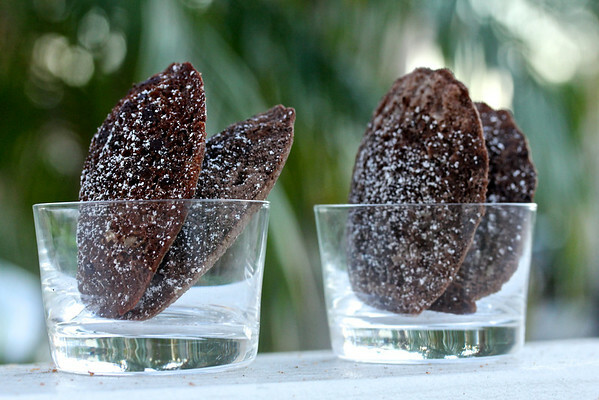 They are delicate little French cookies/cakes baked in a special pan that shapes the cookies like a sea shell. Basic madeleines are made of eggs, flour, baking powder, salt, sugar, butter, and vanilla. This recipe also includes cocoa, Frangelico, Nutella, and chocolate chips. Nutella is a hazelnut spread flavored with cocoa, and Frangelico is a positively divine Italian hazelnut liqueur. Perfect nosh for a party. Check out my first attempt at madeleines made with a genoise batter. 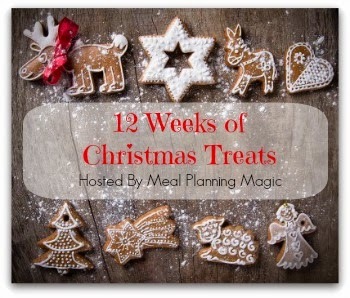 This is the first week of Twelve Weeks of Christmas Treats created by Brenda of Meal Planning Magic. Each week we post recipes for treats that would be perfect for a holiday party table. We also have a Pinterest board that you can follow to get great ideas for your holiday dessert table. (If you are a blogger and would like to bake along, here is a >link< with information about participating). Equipment needed: Two 12-cavity madeleine pans. In a medium bowl, beat the eggs and sugar at medium speed. Add the flour, cocoa powder, baking powder, and salt, and beat on low until just blended. Beat in the Nutella, Frangelico, and butter until blended. Add the mini chocolate chips and stir. Place the batter into a one gallon zipper bag and refrigerate for 3 to 24 hours. Place racks in the top third and middle of your oven and preheat it to 325 degrees F.
Butter and flour two 12 cavity madeleine pans. Cut one corner of the bag of batter and pipe the dough into the cavities of the pans. they should be about 2/3 full. Bake for 16 to 20 minutes, one pan on the top rack, and one pan on the middle rack, rotating the pans halfway through. Pull them out when the batter is set and the edges begin to brown. Cool in the pan on racks for 5 minutes. Tap the pans over the racks to dislodge the madeleines and cool them on the racks until completely cooled. Dust them with powdered sugar. Store in an airtight container for up to three days. Thanks so much! The book has so many varieties it is hard to choose. I made madeleines for the first time recently and they came out great. I should try these next!